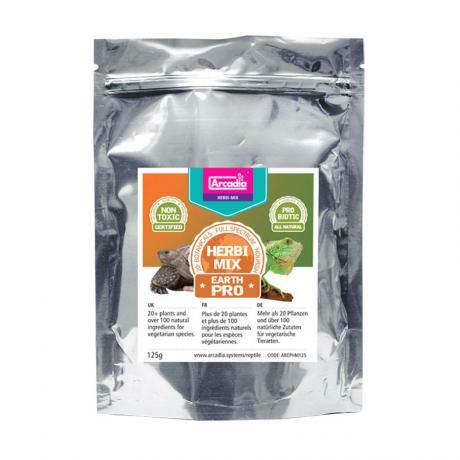 EarthPro Herbi-Mix is an all natural non toxic food sprinkle designed for vegetarian species of reptiles and similar animals. It is a full spectrum and potent dietary supplement with vitamins and minerals, probiotic, whole leaf plants and bee pollen as well as over 100 additional ingredients. It contains zero Phytic acid which can interfere with uptake of other nutrients. This is not a complete food and is intended for use as a dietary supplement at the rate of 5-10% of the usual food. Packed in a re-sealable foil pouch.